Progressed Chiron conjunct Clinton Mercury (Tenth House ruler): long-term injury of some sort, related to her career. This doesn't peak until 2017 -- it may not affect the election. Transiting Sun conjunct Clinton Venus: the day will bring something pleasant. Transiting Mercury conjunct Clinton South Node: news (Mercury) of a loss (South Node). Transiting Saturn conjunct Clinton Jupiter: this could in fact be an indicator of either new-found authority, or difficulty (maybe with publicity) or both. Jupiter here rules the Second House and the Fourth House, so there could be impacts to Clinton's finances and/or home situation. Real estate? Moving house (a white one?)? Transiting North Node approaching Clinton Mars and MC: very good for Clinton's power and authority in general, especially in December and January. This bodes well for her. Prognosis? 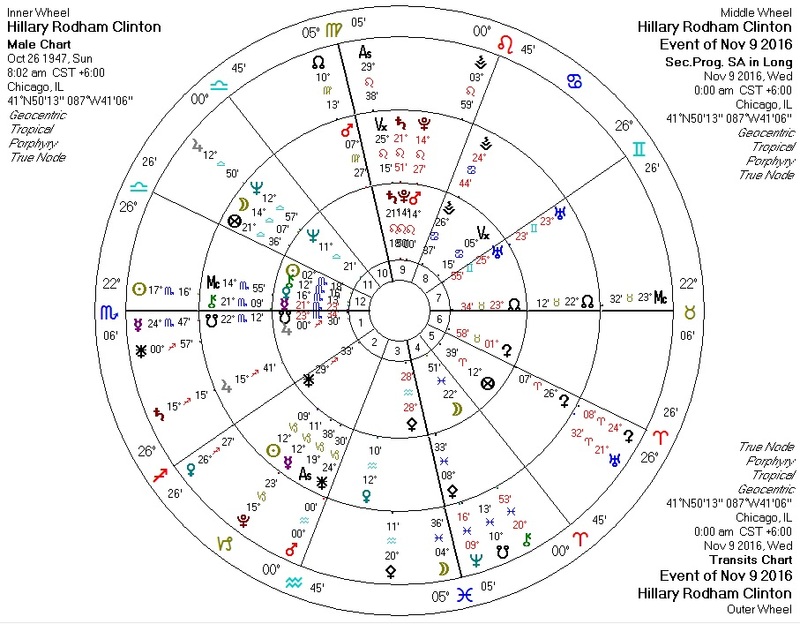 Pretty good, for Clinton -- if she's on the Democratic ticket, and assuming she's not running against Chris Christie or some other Republican with great election-day transits (in which case we may have an astrological toss-up). Whether a Hillary Clinton presidency would be good for the nation is another issue entirely.